As winter’s last freeze comes and goes for more of the country, spring planting season is gaining momentum. Your area’s preferred flowers, shrubs, and trees depend on your climate — a plant that’s happy in North Carolina might be miserable in North Dakota, and vice versa. A warming climate is affecting the natural ranges of plants around the country. The U.S. Department of Agriculture (USDA) has formalized these ranges into “hardiness zones” — strips of similar climate that run roughly east-to-west across the country (except in the high mountains and coasts). NOAA has created similar maps based on the annual lowest temperature climate normals for a 30-year period. Zone 3 (average annual lowest temperature of -40 to -30°F) only allows the hardiest of plants, such as garlic and asparagus. Zone 10 (30 to 40°F) allows for tomatillos and other heat-tolerant species. The map shows most regions in between, with occasional inconsistencies due to local microclimates. 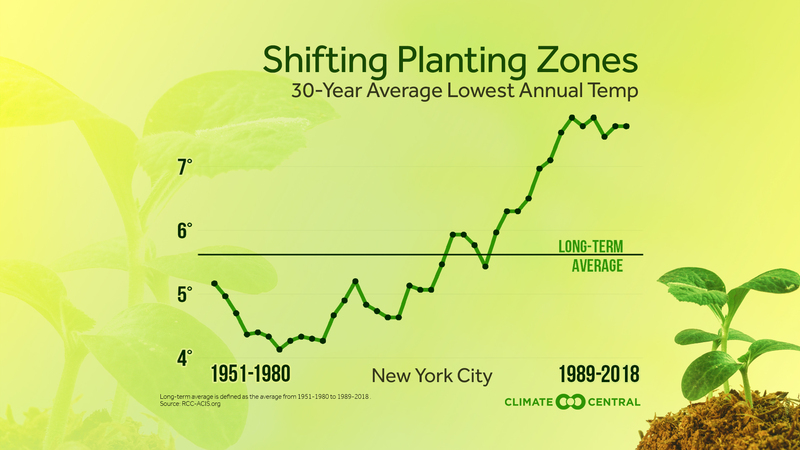 As temperatures rise and habitats shift due to human-caused climate change, these planting zones are shifting north. Compared to a 1951-1980 baseline, the average coldest temperatures of 1989-2018 are more than 3°F warmer for the average city. Temperatures have increased for more than 95 percent of the 244 stations analyzed. This shift is affecting farmers and gardeners alike. According to the Third National Climate Assessment, “many iconic species…may disappear from regions where they have been prevalent or become extinct, altering some regions so much that their mix of plant and animal life will become almost unrecognizable.” The National Wildlife Federation predicts that by 2080, the Mississippi Magnolia and the Ohio Buckeye will shift out of their current zones (and for the Buckeye, into Michigan’s rival turf). In one Forest Service study, 70 percent of the northern tree species analyzed have already shifted north — including cultural favorites like sugar maples and quaking aspen. Planters can adapt by shifting to plants that tolerate heat, drought, and downpours. But these seeds of change are yet another indicator of our warming world. Find your USDA hardiness zone by zip code. Methodology: For each individual point on the local graphic, we calculated the rolling 30-year average of the annual lowest minimum temperature using the Applied Climate Information System. We then calculated the average value of these individual averages to determine the long-term average from 1951 to 2018, as shown by the horizontal line in the graphic.